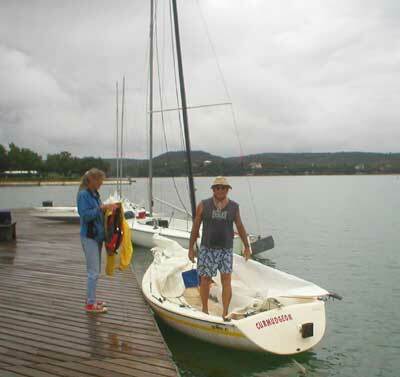 2004 Centerboard Regatta at Austin Yacht Club. 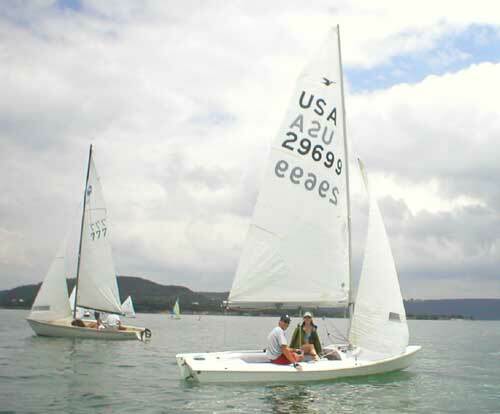 47 boats entered the 2004 Centerboard Regatta at AYC. 17 Lasers, 7 Snipes, 9 in the Portsmouth class, and 14 Sunfish. It looked like rain, and the wind was coming and going. The first race was a triangle course, the first one I've ever raced with 3 upwind legs! No one finished in the 90 minute time limit. 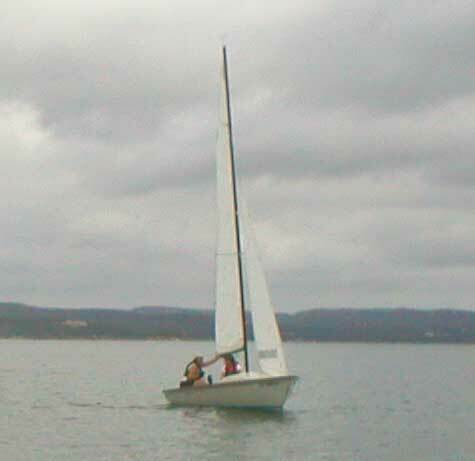 The second race was windy, the third was rained on with wind dying so was called off. Steve Wesson gets his Gallilee 15 ready, he was the 2nd place winner of the Texas Centerboard Circuit racers. Kyle Courtney, on left, was the only Mutineer 15 to show, this is a beautiful boat. On the right is one of the Snipe contestants. It didn't rain ALL the time, we got to see some blue sky now and then. Morris is ahead of Steve at this point, Morris had some bad luck. The Lasers start a race on Sunday. One of the two Boston Whaler Harpoons during the race on Sunday. This was a real light wind challenge, with the wind direction changes bringing a lot of luck into play. Luckenbach flew his spinaker, or at least hung it up there, to cross the line first just ahead of one of the Vanguard 15's. He won with two 2nd place finishes, miracles do occur! John Barlett took first in the Sunfish Class, many thanks to John for being one of the sponsors of this event!